She accused it of an arbitrary and unjustified refusal to grant aid convoys access to remoter areas. Baroness Amos said violence, including sexual violence, continued to increase. The Syrian government has yet to respond to her allegations but has consistently argued that it is doing its utmost to get food and medical supplies to people in less accessible areas. In February, the Security Council called on all parties to allow aid to cross conflict lines and borders. "The situation for millions of desperate people has not improved," Baroness Amos said. "In fact, conflict and violence have intensified over the past four weeks with many people killed and injured." 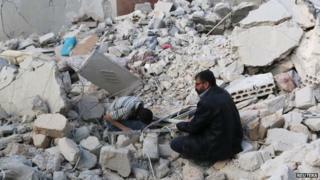 She said that since 22 February there had been about 300 cases of sexual violence recorded in the Damascus area alone. Baroness Amos's remarks come five weeks after the Security Council, in a rare moment of unanimity on Syria, demanded greater access to deliver humanitarian aid. She criticised the Assad government's delays in allowing aid deliveries and noted that assistance had reached just 6% of those living in besieged areas, while 175,000 people remain trapped by government forces and 45,000 people are encircled by opposition groups. The humanitarian chief said that despite the Security Council's demands, the use of barrel bombs by the government has continued, and so too the shelling of civilians. One aid convoy has been allowed to enter over the border from Turkey, but 3.5 million people are estimated to need aid in hard-to-reach areas. Britain and the US are discussing further steps to punish President Assad for what they see as his government's non-compliance with the resolution. BBC UN correspondent Nick Bryant says that would require action from the Security Council and support from Russia - something which the Crimea crisis makes all the more difficult.